Home > Willow Windows Sale Extended into 2015! We’ve continued our slashed prices to get you out of the cold with our New Year 2015 Sale! 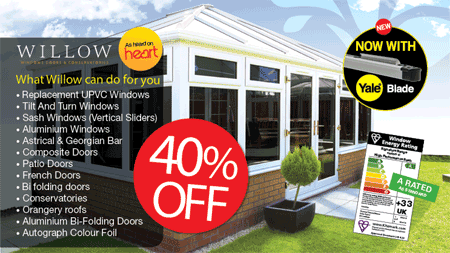 No matter what your project is, new window replacement, new conservatory, replacing the front door or upgrading your entire property with 40% Off All Double-Glazing and uPVC Windows, Door and Conservatory Products, this is the best time to make it happen!